1. Ride with friends in THEIR car or better yet, truck. 2. Take a bush plane or helicopter into your destination. 3. Rent a car and let them take care of the suspension later. 2. Prepare for a hole filled with water. It might deeper than expected. The visual effects of a car wash would have been great when I hit the mother of all holes. Alas, it was dry. 3. Have a solid grip on the steering wheel with both hands to prevent loss of control from a sudden jerk of the car. And just smile when a comment is made inside the car when you do hit a hole. 4. Don't brake at the last minute. This can cause more damage to your car in the long run. Did I tell you how much a new muffler costs? Or an alignment? 5. Be sure to inflate your tires before the journey. Don't start low. 6. 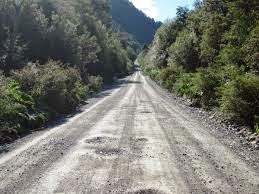 And of course, don't go on any dirt road journey with old tires. No need to weaken the old and have a blow out in the middle of nowhere! Well, at least I got a point for this one. So, the journey begins. You forget the little road trip out and all the fillings in your teeth are in place. It's time to fish!!!! Don't ask me to drive!!! Pam doesn't allow me to drive when we go fishing. She probably has a good reason like I fall asleep within 15 minutes after starting out. Luckily I live in a state that paves their roads. From someone who spends a good amount of time on back roads, those two words are (in my opinion) the most important. Drive slow. Don't discount the rest of your suggestions either. You don't want to be broken down out in the middle of nowhere. Mark ~ I promise to take it slow... I can't afford to buy a new car right now. This jalopy must go another 50k... I'm now at 200k... haha. So, two years of slooooow. I need a truck. cars just dont cut it! I have had friends ruin their axles driving on old country roads and hitting potholes that blend in with everything else. The potholes and rigors of getting there is worth it, especially if you are fishing the Madison in Montana. The video really showed how special this place is not to mention the trout you can connect with there. Great Post!! Hi Bill ~ The Madison was good to me again. How I love that river... Next time you come out here, we have to meet up and fish a day. It would be so much fun!